We monitor beach water water quality at several Lake Erie beaches to help beachgoers know what to expect when they visit Edgewater and Villa Angela beaches. 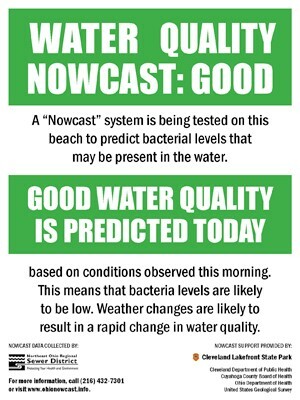 This page, beach signage, and our @NEORSDbeaches Twitter account can help keep you informed of our water quality predictions and what they mean. What are water quality advisories? 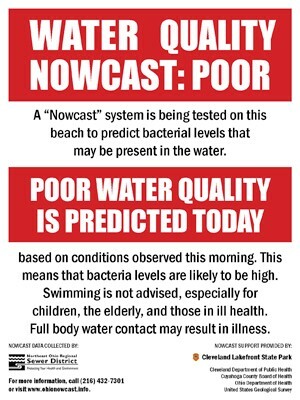 Based on morning conditions observed at the beach and Northeast Ohio Regional Sewer District data collection, the Nowcast system predicts beach water quality. These predictions account for recent weather patterns, rainfall, wind direction, and other factors that can affect bacteria levels in recreational beach water. Reports can help beachgoers know what water conditions they may anticipate before visiting Cleveland’s Edgewater and Villa Angela beaches. Do predictions or advisories indicate if a beach is open or closed to the public? Advisories are not an indication of whether a beach is open or closed to the public. That decision may or may not be related to water quality, often because factors beyond water quality—such as wave conditions, rip currents, debris, or other issues—also affect the actual beach status. For the latest beach status at Edgewater Beach or Villa Angela Beach, contact Cleveland Metroparks. When water quality is good and bacteria levels are low, you will see a green box alert above, and you will see this sign displayed at Edgewater and Villa Angela beach entrances. When bacteria levels are likely to be high (typically after heavy rain), you will see a red box alert above and this sign posted at Edgewater or Villa Angela beaches. In these conditions, full-body water contact is not advised due to elevated bacteria levels.